Protech 3401 Newport Automatic Knife in Silver handle Stonewash Plain blade, Overall open length 7.125 inches with a 3 inch S35VN blade! 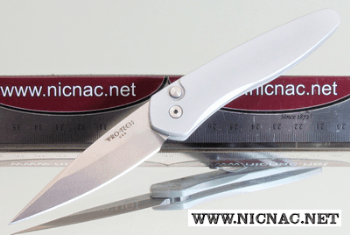 The Protech Newport is a stunning automatic knife that is a larger version of Protech's Sprint knife. The Newport knife comes with an S35-VN steel blade and a tip-up carry pocket clip. The overall open length is 7.125" with a 3.0" blade. The handle material is T6-6061 Aluminum. As always with Protech Knives it's MADE IN THE USA!